This is how the entry for ‘Caesarean’ looks in the 1989 Second Edition of the OED. It’s basically unchanged since the original 1893 printing. Even the spelling ‘Cæsar’, as opposed to ‘Caesar’, is a bit of a giveaway as to how old-fashioned this entry is. The entry hasn’t yet been revised in the post-Second-Edition online revision. ... primusque Caesarum a caeso matris utero dictus, qua de causa et Caesones appellati. ... and the first of the Caesars, who was said (to have been born) from cutting (caes-) his mother’s womb; the Caesones (family) also got their name that way. The emperors of the Romans receive this name from Julius Caesar, the one who was not born. 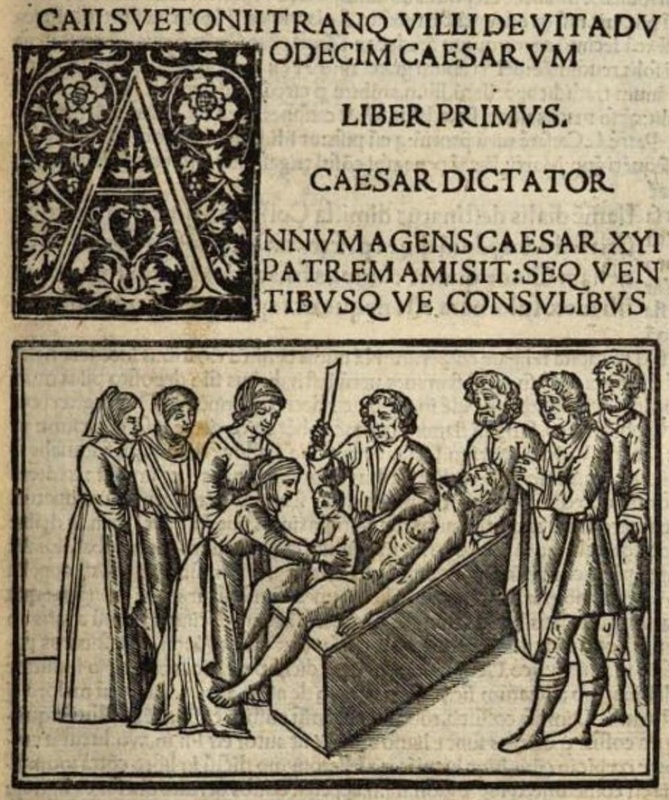 For when his mother died in the 9th month, they cut her open, took him out, and named him thus; for in the Roman tongue dissection is called ‘caesar’. Probably the earliest printed illustration of a caesarean section, depicting J.C.’s birth: from the 1506 Venetian edition of Suetonius’ Lives (coloured in some copies). The accompanying notes mention several of the stories quoted here. Notice that, here, J.C.’s mother appears to have died -- unlke the real Aurelia, who lived another 46 years. 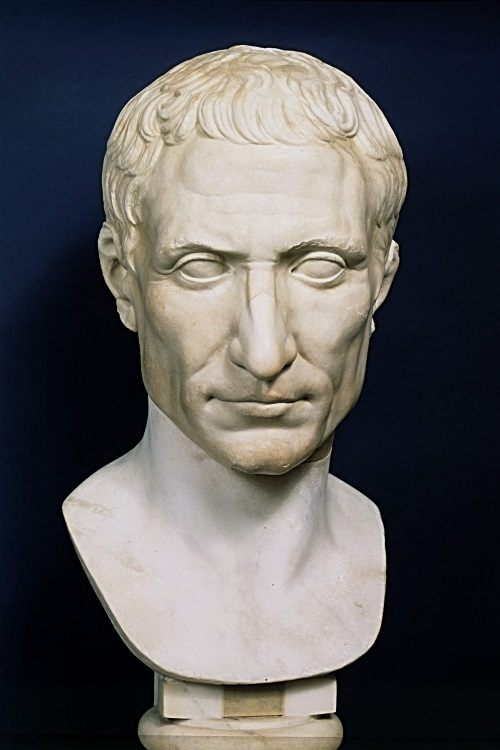 We know of people named Caesar going back many generations before J.C.: the earliest known Caesar is one Sextus Julius Caesar who held a praetorship in 208 BCE. Neither of the ancient biographies of J.C., by Suetonius and Plutarch, so much as mentions his birth, let alone any unusual circumstances. According to the most learned and erudite people, the person who was first called ‘Caesar’ got the name either (1) from an elephant, which in the Mauretanian language is reportedly caesai; or (2) because his mother died and he was born by cutting (caes-) open the belly; or (3) because he poured out of his parent’s womb with a thick head of hair; or (4) because he had pale grey (caesi-) eyes and thrived more than most people do. With this context, it’s clear that all of the stories are inventions. They’re ‘just so’ stories, designed as guesses for how the name came about. Even if by some miracle one of them were correct, we’d never have any way of telling. Having said that, there’s no doubt that the modern name for the life-saving procedure -- ‘caesarean section’ -- is based on the J.C. story. The illustration, above, from the 1506 edition of Suetonius, may even have been an inspiration. 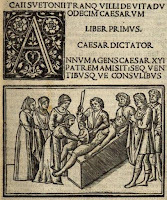 Some people suggest the name for the operation is linked to a (purportedly early) Roman law that mandated caesarean sections on women who died while pregnant, which came to be known as a ‘caesarean’ law in late antiquity, thanks to the J.C. story. That’s comparatively obscure, though: I find it easier to imagine 16th century physicians reading Pliny than the Digest of Justinian. Caesar. Et tu, Brute? Then fall, Caesar! Calpurnia. Julie don’t go, I said, it’s the Ides of March, beware already! This one’s relatively easy to dispose with. It’s only Shakespeare that has him saying ‘You too, Brutus?’ in Latin -- or, to be strict: Shakespeare, and a few other 16th century plays. utque animadvertit undique se strictis pugionibus peti, toga caput obvolvit, simul sinistra manu sinum ad ima crura deduxit, quo honestius caderet etiam inferiore corporis parte velata. atque ita tribus et viginti plagis confossus est uno modo ad primum ictum gemitu sine voce edito, etsi tradiderunt quidam Marco Bruto irruenti dixisse: καὶ σὺ τέκνον. Even Suetonius doesn’t quite believe the story of the last words, and he was more gossip columnist than historian. Other accounts -- Plutarch Life of Caesar 66.7), Cassius Dio 44.19.4-5 -- agree about many details, including the covering his face, and in Plutarch’s case, the toga gesture and the number of blows, but there are no last words: J.C.’s only response to seeing Brutus is to cover his face. Cassius Dio, like Suetonius, emphasises that he spoke no words at all. So we’ve got plenty to reject the words to Brutus as spurious. There’s also the fact that Brutus was not Caesar’s ‘child’ in any way, shape, or form (the story that Caesar adopted him is an invention, based on this very passage). But it’s especially weird how the words are given in Greek. Despite the opinions of certain pop historians, Greek was not anything like a common mode of speaking for aristocratic Romans: even Cicero, who was fluent, wrote to his best friend, who was an ardent hellenophile, in Latin with only sprinklings of Greek. Augustus never got comfortable enough in Greek to hold up a conversation; Marius knew no Greek at all. καὶ σὺ τέκνον ποτὲ τῆς ἀρχῆς ἡμῶν παρατρώξῃ. You too, child, will one day have a nibble of our power. In this form the line makes a dactylic hexameter, which would suggest an origin in Hellenistic epic or elegiac poetry (though it should be pointed out that the lack of a sense-break at the third-foot caesura raises grounds for doubt, and ποτέ doesn’t attach to τέκνον very comfortably). The words may well be old, but the idea that Caesar spoke them is obviously a fictional invention. 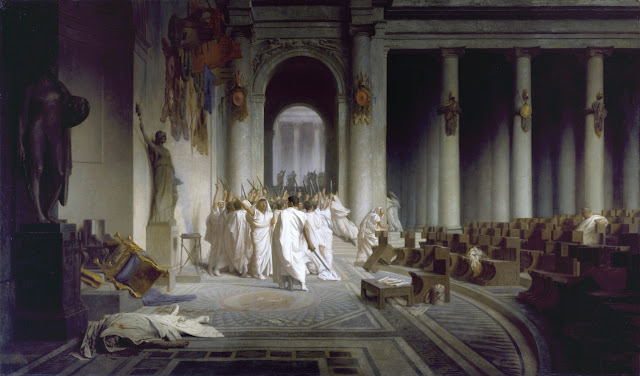 In the first place: Suetonius, Plutarch, and Cassius Dio all believe that he didn’t speak. And in the second place: who, while being stabbed 23 times, would offer a moral judgement on their slayer with an apposite epic quotation in a foreign language? How many teeth did Bertrand Russell have? Did Galileo float in water? Ἔχουσι δὲ πλείους οἱ ἄρρενες τῶν θηλειῶν ὀδόντας καὶ ἐν ἀνθρώποις καὶ ἐπὶ προβάτων καὶ αἰγῶν καὶ ὑῶν· ἐπὶ δὲ τῶν ἄλλων οὐ τεθεώρηταί πω. Males have more teeth than females, in the cases of humans, sheep, goats, and pigs. In other species an observation has not yet been made. [Bertrand] Russell provides a concise summary of the thoughts of both [Plato and Aristotle], as well as painting a picture as to why they are so important, despite being wrong about almost everything. Aristotle maintained that women have fewer teeth than men; although he was twice married, it never occurred to him to verify this statement by examining his wives’ mouths. He said also that children will be healthier if conceived when the wind is in the north. One gathers that the two Mrs Aristotles both had to run out and look at the weathercock every evening before going to bed. He states that a man bitten by a mad dog will not go mad, but any other animal will (Hist. An., 704a); that the bite of the shrewmouse is dangerous to horses, especially if the mouse is pregnant (ibid., 604b); that elephants suffering from insomnia can be cured by rubbing their shoulders with salt, olive-oil, and warm water (ibid., 605a); and so on and so on. Nevertheless, classical dons, who have never observed any animal except the cat and the dog, continue to praise Aristotle for his fidelity to observation. The trouble with attacking the entire oeuvre of a scholar and scientist in this way is that the examples are very, very cherry-picked. These five blunders are taken from a span of over 400 pages of tiny print full of literally thousands of observations about the animal world. Do we take Russell on faith that they’re representative? No, we don’t. And I’m not going to let that ‘and so on and so on’ pass. If you want to show that Aristotle was wrong about almost everything, show that he was wrong about almost everything. ‘And so on’ is lazy if you can’t back it up. Russell couldn’t. Russell’s first criticism, about women’s teeth, is the one that gets the most traction. That must be because it’s the easiest one to correct. Testing the claim about conception during a north wind would require an enormous amount of coordination and many years of research; no one is going to try out the effects of rabies on humans; I defy anyone to get a shrew to bite a horse on command; and elephants were not exactly an everyday sight in ancient Greece. In fact some of them don’t even necessarily look like blunders, if you approach them in the right way. Seasonal winds are a thing: in Greece, a north wind at conception will often correspond to a birthday between mid-February and the summer solstice. And the time of year of a birthday can correlate very strongly with a child’s success under some circumstances. Aristotle didn’t know why that was, but he did know something about astrology, a field which was not considered ridiculous in his day, and which made similar kinds of predictions. And the behavioural effects of rabies are unquestionably different in animals that can talk and communicate their distress (humans) and those that cannot (every other species). I won’t venture to defend Aristotle on shrew bites and elephant massages. And then there’s the teeth thing. Aristotle doesn’t use it as a way of showing that women are inferior to men, contrary to what is often claimed -- but it does look ridiculous. Did Bertrand Russell count the teeth of any of his wives? Robin Herbert poses this question in an eloquent defence of Aristotle written in 2014. I certainly haven’t ever counted anyone else’s teeth. I only even counted my own when I was about 10 and was wondering how my adult teeth were coming on. Aristotle, Russell, Herbert, and myself -- we all rely on other people to do that for us. Herbert’s defence of Aristotle focuses on rejecting the false idea that Aristotle put his own preconceptions ahead of any observations. Of course Aristotle is wrong, but he is wrong because he was misinformed about the observation, not — as Russell and de Bono suggest, because he did not believe that observations were important. With that in mind, let’s do a fact-check of all of Aristotle’s claims about teeth in History of Animals book 2 chapter 3. We don’t want to cherry-pick, do we? I’ll score TRUEs as 1. Number 14 gets 0.75: the observations are all accurate, but the interpretation is only half accurate. Number 20 gets 0.75 as well, since female elephants’ tusks curve upwards. So Aristotle on teeth gets a score of 17.5 out of 21, or 83.3% correct. In my university’s marking schedule, that would get him a grade of A-. Certainly not perfect. But it could be much much worse. The usual accusation cast at Aristotle is that he put theory, logic, and his own preconceptions ahead of any empirical evidence. Do you seen any sign of that in the list of his claims about teeth? I sure don’t. I see a whole bunch of second-hand reports of empirical observation: most accurate, some inaccurate. I don’t see any trace of a priore assumptions. Aristotle’s argument [was] that the falling body moved more jubilantly every moment because it found itself nearer home. -- and many eminent scientists, like B. F. Skinner and Stephen Hawking, have taken this claim on faith even though it is the most bald-faced lie. Now, it is true that Aristotle probably believed that heavier bodies fall faster than light bodies. 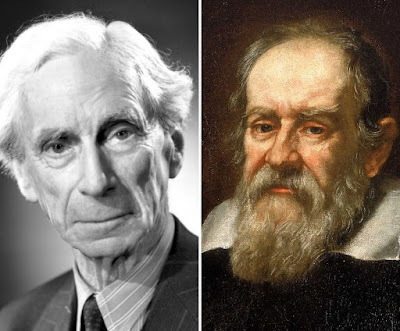 And it is certainly true that he was interpreted that way throughout the Mediaeval period and Renaissance, until Galileo’s famous experiments. But once again, Aristotle’s problem isn’t a result of letting a priore assumptions take precedence over empirical evidence: the problem is one of confusion. The confusion is between gravity and buoyancy. Because in buoyancy, things absolutely do accelerate differently depending on their density. The context of Aristotle’s claims about heavy and light bodies accelerating differently, in On the sky 308a-b (4.1-2), makes it crystal clear that he is really talking about buoyancy, without realising it. Language recognizes (a) an absolute, (b) a relative heavy and light. ... Our predecessors have not dealt at all with the absolute use of the terms, but only with the relative. I mean, they do not explain what the heavy is or what the light is, but only the relative heaviness and lightness of things possessing weight. ... By absolutely light, then, we mean that which moves upward or to the extremity, and by absolutely heavy that which moves downward or to the centre. By light or relatively light we mean that one, of two bodies endowed with weight and equal in bulk, which is exceeded by the other in the speed of its downward movement. Those of our predecessors who have entered upon this inquiry have for the most part spoken of light and heavy things only in the sense in which one of two things both endowed with weight is said to be the lighter. (My underlinings.) You see how the confusion arises? He believes some things like flames are ‘absolutely light’ because apparently they always go up; and he’s wrong about that, because fire is buoyant in air, not because it’s ‘absolutely light’. He hasn’t understood that light : heavy is something different from buoyant : unbuoyant. His definition of heaviness relates to buoyancy, not weight: ‘that one, of two bodies endowed with weight and equal in bulk, which is exceeded by the other in the speed of its downward movement’. This is an exact description of a relatively dense body, that is to say, an unbuoyant body. So, once again, his problem isn’t that he hates empirical evidence. On the contrary: he has a good grasp of how buoyancy works in practice. It’s that he doesn’t realise that there are situations where even a maximally buoyant object, like a flame, won’t move upwards -- namely, in a vacuum. If he had lived a century later, and had a chat with Archimedes (whose discovery of the Archimedes principle was more explicitly about buoyancy), Aristotle might well have worked it out. Unfortunately, he didn’t. Archimedes didn’t connect the dots, though he could have. Nor did any of Aristotle’s mediaeval followers. Instead, we had to wait for Galileo, who wasn’t interested in the context of Aristotle’s original claim. Because in context, the underlying idea was dead right: Aristotle’s mistake was in generalising from it. In fact, it’s hard to believe Galileo even read the Aristotle passage I quoted above. Salv. ... I greatly doubt that Aristotle ever tested by experiment whether it be true that two stones, one weighing ten times as much as the other, if allowed to fall, would so differ in speed that when the heavier had reached the ground, the other would not have fallen more than 10 cubits. Simp. His language would seem to indicate that he had tried the experiment, because he says: We see the heavier; now the word see shows that he had made the experiment. Sagr. But I, Simplicio, who have made the test can assure you that a cannon ball weighing one or two hundred pounds, or even more, will not reach the ground by as much as a span ahead of a musket ball weighing only half a pound, provided both are dropped from a height of 200 cubits. Salv. But even without further experiment, it is possible to prove clearly, by means of a short and conclusive argument, that a heavier body does not move more rapidly than a lighter one provided both bodies are of the same material and in short such as those mentioned by Aristotle. First, Aristotle does not say ‘We see the heavier’ at any point; where he does describe his observations of buoyancy, they are strictly accurate. And second, ‘a heavier body ... [and] a lighter one provided both bodies are of the same material’ is exactly not ‘such as those mentioned by Aristotle’. What Aristotle actually says is: ‘two bodies endowed with weight and equal in bulk’ (δυοῖν ἐχόντων βάρος καὶ τὸν ὄγκον ἴσον). Galileo, who was not a well-mannered man at the best of times, is arguing against what he imagines Aristotle said. Recent figures like Russell, Butterfield, Skinner, and Hawking are following all too closely in Galileo’s footsteps: in misrepresenting an exceptionally clear-headed researcher who was an empiricist, albeit one who made mistakes; someone whose chief flaw was that he sometimes trusted reports of observations which, in hindsight, he should not have trusted. Put another way: taking other people’s reports on faith is a flaw shared by Aristotle, Skinner, and Hawking. If that makes Aristotle the scientist who got everything wrong, doesn’t it do the same for Stephen Hawking?